They are hand sharpened and then polished at the factory and have exceptional attention to detail and quality. HQY premium stainless steel designed to hold the edge of the knife whilst also resisting rust. A multinational knife that used all over the world in different ways for different purposes. The must-have in your kitchen!For effortless carving of vegetables,roasts,turkeys,ham,fish and shellfish.Serving becomes a real pleasure with this knife! This cleaver is designed to effortlessly carve all bones and tendons! Very useful when you're looking for very thin slices of ham salmon! Typical knife with a short blade to cut all types of cheese.The combination of the ergonomic handle and the shape of the blade allow for comfortable cutting. This knife is designed to easily slice through the thickest melons.The ergonomic handle allows for great comfort while cutting. A knife's edge is very fragile and after frequent use the knife's "feathers" will curl.Get fid of dull knives with the SR sharpening steel in no time at all!if you regularly sharpen your knives(after every use if possible).they will retain their good as new conditions for months. A handy assistant when carving meat(like a roast for instance). 9 Piece professional chefs knife set, Get set of knives.for not only chefs! These were a gift for a chef. 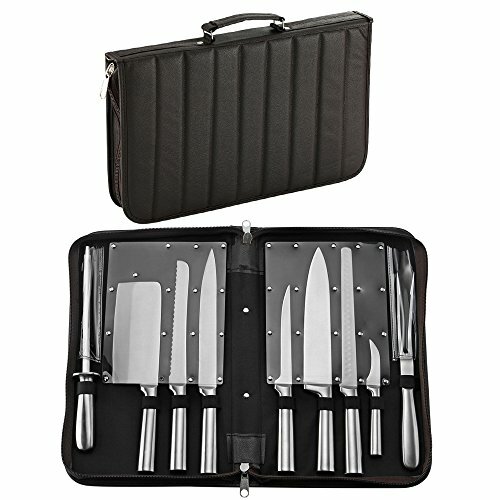 This fantastic HQY Professional 9 piece chefs knife set comes in a storage case which is perfect if you are travelling as well as being a storage case whilst the knives are not in use. OUTSTANDING CUSTOMER SERVICE and always there to assist you with any problems or concerns. Simply contact us and we will be happy to address any of your concerns.